Are you looking to arm yourself with the knowledge to ensure your business has the best merchant account? This is not some lame guide full of filler and cliches, it’s the defacto guide on the internet for merchant accounts. You’ll get to see everything from the basics of what a merchant account is and does, though to the top companies based on your business type. Plus; fees, getting set up and everything in-between. Grab a coffee and by the time you finish this article you will be a merchant account expert too. If you don’t fully understand what a merchant account is then watch this video. Whether you run a startup or an established business, payment processing is a core component and determinant of your company’s success. With fast-track technological advancements and innovative payment processing solutions currently on the market, you may ask yourself what are the processes and costs of setting up a merchant account or payment processor? Equally important – Do you need advanced technical skills to handle complex or basic integration processes end to end? Otherwise can you simply rely on your in-house team of skilled professionals, outsource the tasks to an independent contractor or pivot exclusively on the expertise and advice of your payment processing provider? This easy-to-follow and comprehensive guide not only will get down to the nitty gritty but will also give you a clear idea on what skills you might need to becoming a master at taking in-store or online payments. Don’t worry about technicalities – just let your entrepreneurial spirit come forth and everything will fall into place! Local (UK) and global players – Find out who holds sway in the industry and how their services can benefit your business and determine its trajectory. Our top 10 list sheds light on the best features for choosing the right payment processing provider for your company. Security concerns – How can you protect your company and your customer from fraudulent attempts and decrease liability? From PCI DSS compliance to SSL Certificates, there are solid methods to convey trust in your brand and increase conversation rates by as much as 35%. 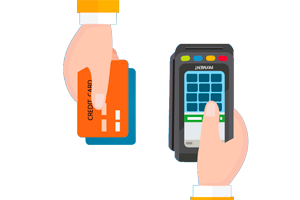 Payment Gateways and PDQ Machines – Whether in-store or online, payment processing solutions can seem a bit daunting for the uninitiated! However, as you’ll discover down below there is a step-by-step implementation for each instance. Costs – Having a merchant account and payment gateway can incur unexpected costs (north of £1,000 annually) if you do not fully understand its scope and purpose for your business. Setup fees, transaction fees, gateway fees, chargeback fees, monthly or flexible plans, PCI DSS compliance and other security issues can make your merchant account spending skyrocket without a solid financial plan. Let us guide you through with our accurate quotes! 5 How does credit card processing work? For a brick-and-mortar business the benefits of accepting electronic payments over cash-in-hand are rather obvious – popularity with consumers (in 2016 more than half of all payments in the UK were made with a credit or debit card), better record keeping, lower risks and faster transactions. However, when it comes about the online medium, you are spoiled with two very attractive options – merchant account or online payment service/processor. Which one should you choose? Why does it matter which merchant account to choose? In the UK, much like anywhere else, there are two types of traditional merchant acquirers – high street banks (HSBC, Barclays, Lloyds etc.) and independent payment service providers (Worldpay, Sage and others) which offer more competitive rates and reasonable contracts. Many of the companies in this industry have bought each other and merged into new payment service providers, so do not be surprised to find out they offer more or less the same features and are all somehow interconnected. In our top 10 list for UK merchant accounts, we take a close and in-depth look at the major players, what makes them stand out and how you can benefit from their services. In the comprehensive comparison table, we have outlined the core features that are currently prevalent in the industry. Looking for info on a specific company info? Click and jump to supplier. So, here is our top 10 providers reviewed. 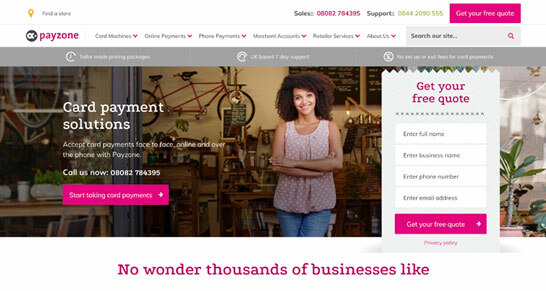 Quick jump if you are looking for free payment processors or international merchant accounts. Flexible pricing with a Pay As You Go plan for both in-store and online businesses – In our analysis Worldpay are one of the few traditional merchant acquirers transparently advertising this payment plan. Rates start at 2.75% + £0.20/transaction and go down with a higher turnover. Omnichannel Payments – While merchants in the UK are still trying to decipher the benefits or even the true meaning of this revolutionary strategy, the reality is that omnichannel payments have been around for quite some time. These solutions enhance customers’ in-store and online shopping experience via multiple platforms and integrate all payments into one single point of sales. It’s as if the boundaries between the online and physical mediums cease to exist! Solid focus on Asian markets – Through their Asian-focused alternative payments such as UnionPay and Alipay, Worldpay open your business to a new galaxy of opportunities – from China! With more than 300,000 Chinese tourists visiting the UK yearly and 2.7 times more online spending with UK retailers than domestic shoppers, your business can benefit greatly if you know where to look for new sales horizons. Industry-leading security – Whatever crosses your mind in terms of enhanced and advanced security, just tick it off the list! 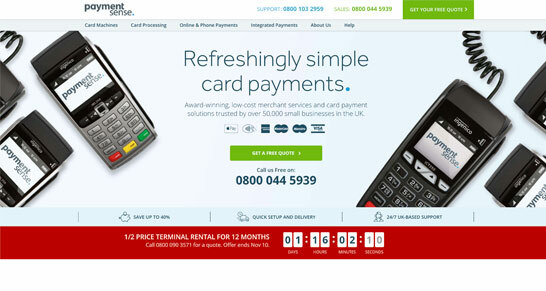 Superb website navigation and online resources on technical processes – Worldpay are unique in how concisely and clearly they advertise their services but more so in how much technical material they provide you with! 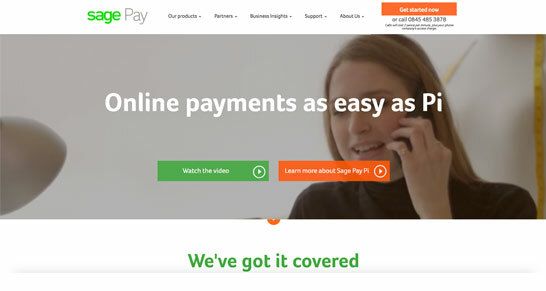 If you called the odds on Sage Pay as a runner-up, congratulations – you got it right! They come in a close second, with an array of features almost as comprehensive as Worldplay’s. In addition to Dynamic Currency Conversion (in-store) and Multi-currency Payment (online) which let international customers pay in their own currency, Sage Pay also offer Tax Free shopping for non-EU citizens. Competitive transaction rates – from £0.59/transaction (for invoice payments). Great customer service – The positive online reviews about the company speak volumes! Free advanced fraud screening tools – While some of their competitors charge extra for this service, Sage Pay go the extra (online) mile to strengthen your business with the best security practices. Seamless and fast integration – Their API supports most major shopping platforms and even a highly efficient stock management system for a better cash flow management. 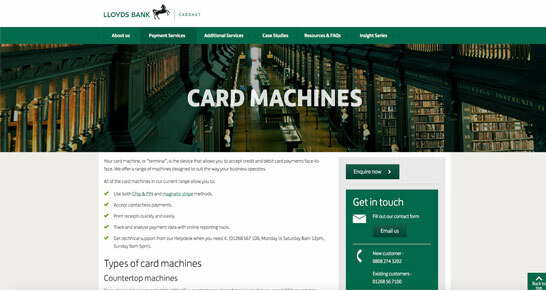 As an award-winning merchant service provider with an emblematic reputation, Lloyds Cardnet attract major businesses in the UK. While their service is not sublimely rich in features, they have a very transparent and fair pricing system which is designed to support your business growth. Personalised service with a dedicated relationship/project manager – This tailored service is another solid testimony to Lloyds’ strong commitment for their clients. This service is offered in addition to the card payment helpline. State-of-the art Clover station (smart-till) – While your EPOS system might be more of a bare-bones cash register by today’s standards, the Clover station is a genuine business management solution which lets you control your inventory, manage employees, transactions and ultimately offer superb customer service. Seamless and rapid setup process – One of the downsides of having a merchant account is the lengthy registration process which requires you to provide ample evidence of your business history, business model and plan, solvency, financial liability and any other supporting documents. While this is still the case with Lloyds Cardnet, they do try to expedite the process within 10-15 days so you can have your merchant account up and running no later than within a month. Fixed Rate of 1.25% for all MasterCard & Visa Credit & Debit Cards (AMEX not included) if you’re a Lloyds Bank Business Account holder. Headquartered in the US and serving more than 6 million merchants, First Data are one of the largest payment processing providers in the world. One aspect that distinguishes them from their competitors is that they provide merchant solutions not only to small businesses and multinationals, but to financial institutions as well. In talks to introduce UnionPay – While this partnership has been successfully reached in the US, for the UK market they are still in negotiations. Free online technical guides – Whether you run a restaurant or a coffee shop, their free guides containing detailed information on profitability and customer loyalty through technical solutions and innovations represent an extra service valuable to your small business. Global Merchant Gift Card Programme – Designed for retailers offering gift cards and vouchers, First Data Merchant Branded Gift Card Programme focusses on end to end solutions such as gift card market research and campaigns, client conversion, system reliability and fraud protection. Their multi-currency payment and dynamic currency conversion come with regularly updated currency rates which minimises risks associated with financial losses ensued from fluctuations. Advanced API Integration and Hosted Payment Page – Their payment gateway is a solid ecommerce solution that alleviates security burdens for your business while allowing you to increase brand recognition with customised and branded pages. While accolades such as Europe-leading merchant service provider might not knock it out of the park for you, then consider Paymentsense’ negotiation power on the market to offer you the best transaction rates – or at least that’s their solemn promise to you! Paymentsense are an established fast-growing corporation with a personal take on their 2009 startup story – two level-headed entrepreneurs experiencing a business epiphany moment while in Las Vegas concluded that the card payment processing industry was broken and they wanted to fix it. Apparently, what happens in Las Vegas doesn’t stay there for too long! Ideal for small and medium sized businesses – As their marketing strategy dictates, they proudly promote the founders’ story and a “boutique” approach to working with their clients. Speedy setup – They streamline the whole setup process within 3 days for credit card machine and 24 hours for a payment gateway! 24/7 UK support – Around-the-clock telephone support and technical assistance by email. Short-term commitment (12-month contract) with flexible plans (starting at £14.95/m). Advanced payment gateway – It supports an impressive range of shopping platforms, including WooComerce, Shopify, Magento, PrestaShop, Drupal, Joomla! and ZenCart. 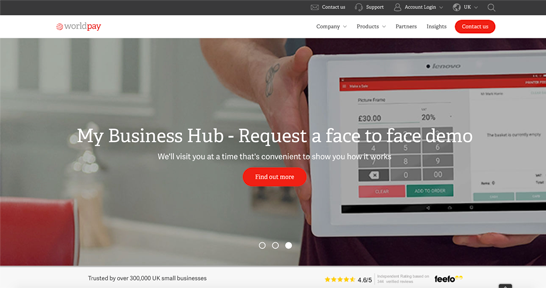 In partnership with HSBC and holding and estimated 20% market share for transactions in the UK, Global Payments are a great merchant solution for local businesses of all sizes! Humanitarian approach to business – In addition to being constantly involved in charities and donations, they proudly (and strategically) market their support for the Modern Slavery Act 2015. What does this means for you? It might just happen that you’re supported by a team of professionals truly committed to solid values greater than turning millions of pounds a year. Robust focus on innovative technologies, scalability and global outreach for your business – Global Payments are trailblazers when it comes about taking your business to new heights of profitability. Advanced payment gateway (via Realex) – It supports 3D Secure, recurring payments and full sales reporting. Easy and secure integration with your current EPOS system. Smart Dispute Manager – On top of your online business account that lets you manage your statements, transaction and customer history, you are provided with with a special account that gives you more flexibility and control over chargebacks and retrieval requests. 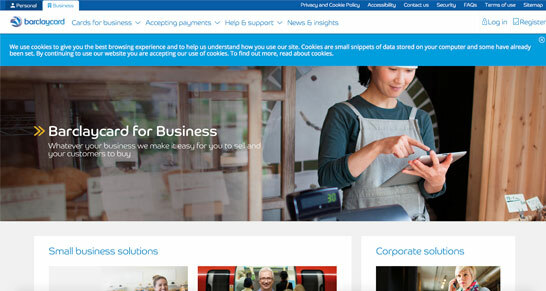 Similar to other high-street banks, Barclaycard operating under Barclays have high requirements when accepting a new business and they normally look thoroughly into your company’s history and business model. Likewise, substantial cancellation fees, long-term contracts (over 18 months in length) and higher transaction fees might make a startup or an owner-managed businesses steer away from their services. On the other side of the coin, Barclays’ 50-year long history coupled with numerous awards and reliable services might compensate for higher prices. Ideal for large businesses and established corporations – Enterprise ecommerce solutions for established businesses starting at £75/month. Excellent customer service and technical support. Enhanced security and anti-fraud solutions. A well-established global company with over 1 million clients, Elavon specialise in vertical markets such as airlines, hospitality, retail, healthcare, restaurants and education. 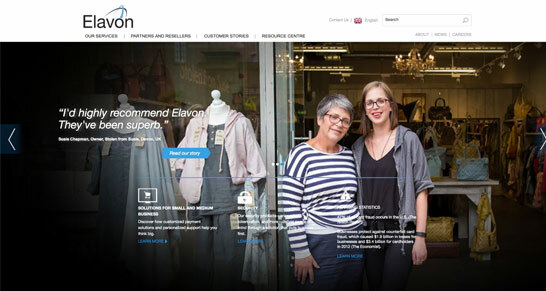 With dedicated services for both small businesses and enterprises, Elavon take the meaning of “tailored services” rather seriously. In joint venture with Santander, Elavon are one of the 5 largest merchant acquirers in the world. Contactless payments – Elavon support all contactless transactions including Samsung Pay which was introduced in the UK in May 2017, fairly recent. This means that many merchant acquirers are still developing their technology and software to support Samsung Pay. However, innovative providers like Worldpay and Elavon have already implemented this solution successfully. Electronic gift cards – Retaining 100% of purchased value to your business, creating new marketing possibilities and increasing sales, electronic gift cards are the safe and modern solution to reward your loyal customers with more points and offer them personalised service. MobileMerchant – For small businesses which find POS systems or credit card terminals too cumbersome or simply crave more flexibility on the go, Elavon offer an ideal alternative which lets you morph your phone or tablet into a payment terminal via the Mobile Merchant’s payment app and a Bluetooth card reader. Flexible Payment gateway – Elavon have developed two efficient ecommerce solutions tailored to your business needs and size: Global Gateway for larger enterprises and Elavon Online Payment Gateway for small and medium sized companies. Nipping at the heels of their competitors in terms of annual transactions , Payzone are in no way inferior to other dominant merchant acquirers. In fact, they have strong relationships with other top performers such as Barclaycard, Elavon or Global Payments. Friendly, committed, creative and with a 25-year history under their belt, Payzone prioritise and cement their focus on small businesses. Affordability and flexibility – With a 12-month contract and no joining fees, Payzone are a true saver for small businesses. Advanced payment gateway – It supports integration with 52 shopping carts, including WooCommerce, Magento, Drupal, OpenCart, ZenCart. In addition to API integration and Hosted Payment Page, it supports Transparent Redirect – a camouflaged method which gives your customer the impression they are still on your website when purchasing although their payment details never touch your system. Fast setup and fast payouts. UK-based support 7 days a week. The smallest merchant account provided (over 3,000 clients) on our list, Card Cutters cater primarily to small businesses, independent retailers, and short-term events (trade shows, conferences) and they excel at doing it. With a fair, transparent and competitive pricing policy, you can rest assured that you are provided with cost-effective solutions and won’t be hit with hidden fees or charges. Flexible plans – Whether you need to rent a credit card terminal for 3 days or 48 months, Card Cutters offer you plenty of options tailored to your business. 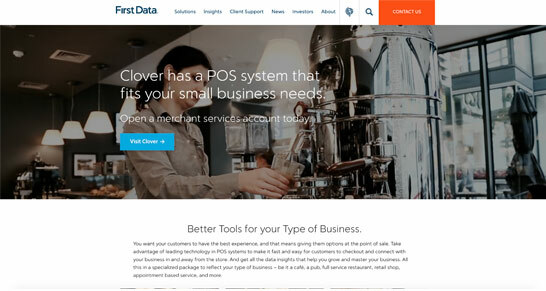 Smart POS – For a merchant account services provider of their size, they truly go the extra mile to offer you as many options as possible: Clover Mini or the full-on Clover station (modern point-of-sale) can really make your business stay ahead of the curve. Multilingual payment gateway – The back-office supports major European languages such as English, German, French, Dutch and Italian. 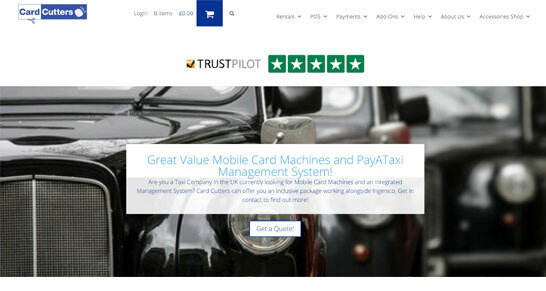 Excellent online reviews – Card cutters claim to be #1 on Trustpilot Reviews in terms of eCommerce solutions (a 95% Excellent Score out of 240 reviews at the time of writing). 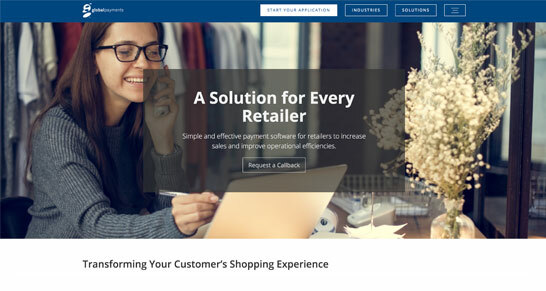 0 Comments To "Guide to Merchant Accounts and Payment Gateways"